With its vibrant retro design, Avenue Café puts a glamorous twist on old school Vegas. Slide into a high-backed booth for a hearty breakfast of a made-to-order omelet and a signature mimosa. Or linger a little longer over a sandwich or burger at lunch. All Griddled Selections Served with Butter and Housemade Maple Syrup. *Consuming raw or undercooked meat, poultry, seafood, shellfish or eggs may increase your risk of foodborne illness. 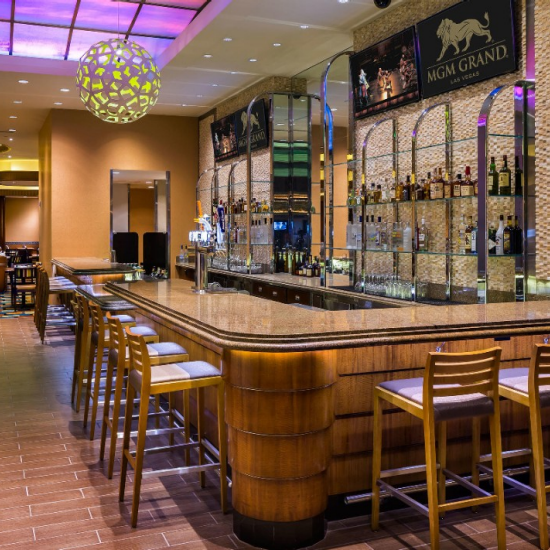 The Avenue Café is located on the MGM Grand casino floor. Walk into the Casino towards Lobby Bar. Avenue Café will be located directly in front of you. Enter the resort from Las Vegas Boulevard. Walk towards Centrifuge and stay to the left passing The Buffet. Continue through the Casino, passing Jabbawockeez Theater. Walk past Starbucks and Avenue Café will be located on your left.